A heron poised and waiting on Mackerel Rocks J5082 : 'Mackerel Rocks', Bangor close to the Seacliff Road in Bangor. Herons are extremely common in the area and are seen all along the shoreline at dusk throughout the year. 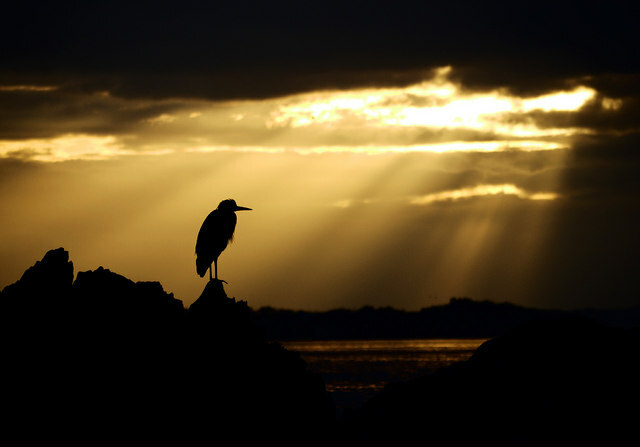 This was actually a rather dull and cloudy evening but the setting sun briefly poked shafts of light through a gap in the cloud to the west producing the dramatic background effect; the heron was polite enough to remain in situ as I positioned myself on the shoreline to get a shot of him with the light behind.